Our classes get funding from the government. The government makes rules about the people who can qualify for free classes. Find out if you are eligible. Manchester Youth Zone provides a unique safe place for young people aged from 6 – 19, up to 25 with additional needs, from across Manchester. With a wealth of sport and creative activities, MYZ currently welcomes almost 1,000 young people each week and we work to raise our members aspirations and equip them with the tools to increase their confidence, build positive relationships and add something back to their own community. Please find attached our latest Community Timetable with lots to do for children, parents and staff! All the usual favourites including Yoga, Circuit Training, Badminton & Table Tennis continue!! North Manchester Air Cadets - They meet Mondays & Wednesdays at Air Training Corps, 91 Longton Road, Blackley M9 6ND. They also hold monthly activities at Our Lady’s Sports Centre. Anyone wishing to join can get in touch with them on 0161 740 8442. Looking to join a junior football team? We have numerous teams that train and play at the Sports Centre. 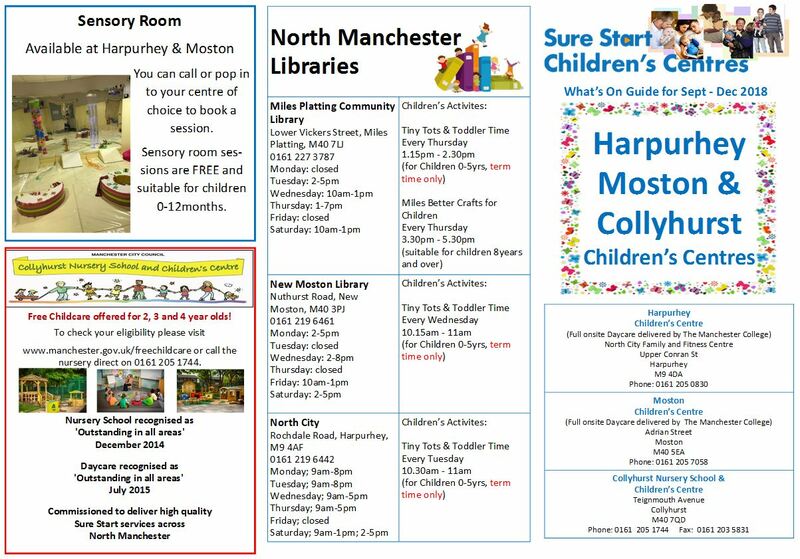 The wonderful Museum of Science and Industry are holding an exciting free family workshop activity after school on Tuesday 11 September 3.30-5pm at North City Library in Harpurhey. It is based around the picture book Izzy Gizmo by Pip Jones and children will be devising a puppet-making activity around how engineer Izzy helps mend a crow's broken wing. The children have designed and painted this beautiful bee as part of the Bee In The City project. Over 100 bees will be around Manchester this Summer as part of a free, family-fun trail. Each Bee has been designed by a different artist or group and we are very proud to 'bee' a part of this wonderful art project. Our bee will be displayed outside North City Library all through the summer. In Autumn, our bee will be brought back to Irk Valley where it will have a permanent home.